Instead of fussing with a pot on the stove and an egg timer that leaves my hard boiled eggs runny, half baked, or sometimes completely hard boiled, I use an electric tea kettle to cook eggs. They come out solid and perfect every time. 1. 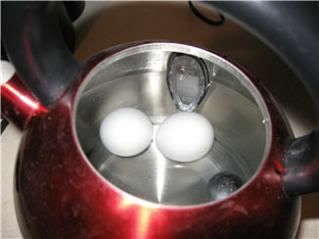 Put the eggs in an electric tea kettle and fill the kettle with water. 2. Turn on the tea kettle and let the water come to a boil. 4. Let the eggs sit in the hot water for 15 minutes. This part is important because hard boiled eggs cook inside the shell from the outside in toward the center of the yolk. If your hard boiled egg ends up with a runny yolk chances are you didn’t allow the hot egg to sit long enough to complete the outside in cooking process. I know this because I’ve done it. While we are on the subject of hardboiled eggs, have you ever peeled one only to have the shell take chunks of the egg along for the ride? I’ve tried adding salt, vinegar, standing on my head, and all sorts of the things that are supposed to make peeling a hard boiled egg easier. They worked to varying degrees of success. Then the refrigerator came to my hard boiled egg peeling rescue. To easily peel a hard boiled egg, first make sure it is done cooking from the out side in and peel the shell from the egg once the egg cools completely. I speed the cooling process along by putting my hard boiled eggs in the refrigerator to cool before I peel them. Most days I’m an impatient eater as well as being a lazy chef. What is your secret to making the perfect hard-boiled egg? Looking for more hard boiled egg cooking options? Check out the following ideas - and more! - below!